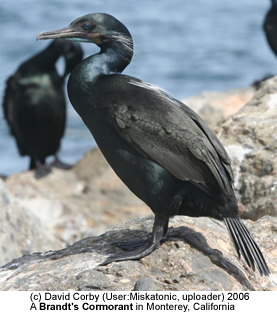 The Brandt's Cormorants (Phalacrocorax penicillatus) are seabirds that inhabit the Pacific coast of North America. In the summer, their range stretches from Alaska to the Gulf of California. The populations north of Vancouver Island migrate south for the winter. During the early breeding season, they develop white feather plumes on the neck and back; and a blue throat patch. Brandt's Cormorants feed either singly or in flocks, and are adaptable in prey choice and undersea habitat. They take small fish from the surface to sea floor, obtaining them, like all cormorants, by pursuit diving using itheir feet for propulsion. Prey is often what is most common in the area they occr. In central California, they feed on rockfish from the genus Sebastes. Off British Columbia, they prey on Pacific Herring. Brandt's Cormorants have been observed foraging at depths of over 40 feet. This species nests on the ground or on rocky outcroppings.